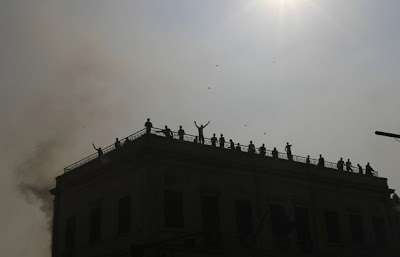 Supporters of the military rulers of Egypt shout slogans against opponents demonstrating against the army rule from the roof of the building housing the ministry of transport and communications in central Cairo on Saturday. CAIRO — The Egyptian military and protesters clashed for a third straight day Sunday, pelting each other with rocks in Tahrir Square, the epicenter of the Egyptian revolution. The skirmishes came a day after soldiers used brutal force to disperse protesters in central Cairo on Saturday as deadly clashes exacerbated tensions in the midst of an electoral season. Wielding batons and firing live ammunition, military police officers escalated a crackdown that has left at least 10 people dead and more than 400 wounded since Friday. Video of military police beating female protesters, dragging them by their hair and in one case stripping a woman and stomping on her chest have gone viral, enraging activists. So far Islamists, who made huge gains during the first two stages of Egypt’s parliamentary elections, have largely stayed away from Tahrir Square. The preeminent Islamic religious institution, al-Azhar, had yet to comment on the death of one of its own, Sheikh Emad Effat, who was killed by gunfire. Thousands mourned him at his funeral Saturday. The April 6 Democratic Front, a breakaway group of the April 6 youth movement, one of the main orchestrators of the 18-day uprising that ousted President Hosni Mubarak, called for Egypt’s military chiefs to be prosecuted for the protesters’ deaths. “They are killing the revolutionaries as Mubarak did, and they deserve to be in the cage like him,” a statement from the group said. The unrest marked a peak in a fluctuating cycle of violence in recent months between security forces and protesters who are demanding that the country’s interim military rulers make good on their promise to oversee a transition to democratic rule. Few of the demands from the dizzying days of the winter revolt that ousted Mubarak have been fulfilled. 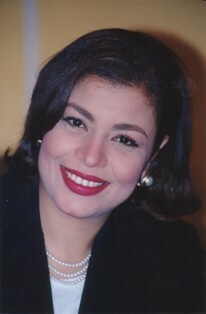 Egypt’s security agencies have not been reformed. The despised emergency law that authorized the indefinite detention of civilians has been expanded, rather than voided. Accusations of grave human rights abuses at the hands of the military rulers rival those that came to light during Mubarak’s 30-year rule. Meanwhile, many observers say, the country’s economy is imploding. On Saturday, a growing number of political leaders condemned the military rulers for allowing and in some cases encouraging the violence to spiral out of control. The latest clashes represent the worst unrest in Cairo since more than 42 people were killed in six days of fighting between security forces and protesters last month. An investigation was promised then, but no one from the security forces has been held accountable. As protests spread to the port city of Alexandria, some political parties called for united action against the military council. “The armed forces’ continuing crimes in killing protesters . . . [prove], beyond a shadow of a doubt, that the military council is no longer to be trusted to manage the transitional phase,” the leftist Social Democratic Party said in a statement. The country’s best-organized political group, the Muslim Brotherhood’s Freedom and Justice Party, condemned the crackdown, accusing the military council of betraying Egyptians’ trust and implying that it was using force for political ends. The party has so far won the most votes in two rounds of multi-phase parliamentary elections set to end in March, and it demanded that elections continue. “Whenever the situation calms down and the country turns to its historical elections in order to achieve its real democratic transformation, someone tries to spark sedition, ignite the situation and instigate unrest, with clear and wanton desire to prevent stability, and disrupt the democratic process and the handover of power,” the party said in a statement. By late Saturday afternoon, the military had erected a wall of concrete blocks to cut Tahrir Square off from Qasr el-Aini Street, where the parliament and cabinet buildings are. Protesters pulled themselves to the top of the wall to pelt soldiers with stones, angered by the mounting casualties. Tents smoldered in the square after soldiers raided the area earlier in the day, beating unarmed demonstrators, brandishing pistols and torching field hospitals. Although evening brought a respite from the violence, protesters described the day’s events as war. The country’s newly appointed prime minister, Kamal el-Ganzouri, addressed the country for the first time Saturday in a televised news conference, calling the latest events an “attack on the revolution” and denying that the military had engaged in violence, including the use of live bullets. Activists were incensed by the remarks from a man they see as a puppet of the country’s military rulers. He spoke just before soldiers entered the square with force. Nadia Sayed, 42, said, weeping, that she had watched the soldiers beat women and men to unconsciousness, pull people out of a mosque and set fire to tents. It did not say that any military personnel were under investigation. At least nine members of a newly formed advisory council, expected to be an influential sounding board for the military rulers during the writing of a constitution, have resigned in protest at the crackdown.